It turns out that the reason you make more mistakes typing on a laptop keyboard than on a desktop is not just because the laptop keyboard feels cramped. Some laptop keyboards are nearly identical in size to a desktop’s, but still don’t feel right. Laptop keyboards are low profile; desktop keys are taller and slightly concave at the top, fitting your finger better. Your fingers stay put on the keys of a desktop keyboard, and this leads to fewer mistakes. We got a new keyboard for traveling with a laptop and we love it. It’s the “OnBoard Travel Keyboard” from Atek.com. It’s a full-size keyboard with a cord that plugs into the USB port of a PC or Mac laptop. It costs $30 and come with a sliding cover to protect the keys. 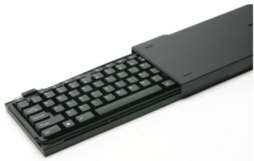 The cover can also be used as a stand to give a slight tilt to the keyboard, which makes typing even more comfortable. With this secondary keyboard, you can set a laptop at a level where the top of the screen is slightly above eye level, which experts say will save you a lot of neck and back pain. All in all this is the best keyboard we’ve seen for laptops.